She had all but given up hope. Severely emaciated, infected with mange and covered in sores, the dying street dog began staggering down the side of the road, one slow, agonizing step at a time. Perhaps in one final attempt to find food, she had rallied every last bit of energy to crawl out of hiding and into the sunlight. Because like many street dogs on the brink of succumbing to injury, starvation or disease, her choice was clear – fight to survive or surrender to death. But call it chance, luck or destiny, everything changed for the ailing dog at that very moment. She had been seen. But when the women got out of the car and tried to get the dog to come to them, the frightened canine simply turned and ran the other way, quickly escaping under an abandoned house across the street from Caron’s home. Shopping plans quickly forgotten, Caron ran back to her house to get something for the dog to drink and eat while Julie stood guard by the opening in the house where the fleeing canine had disappeared. After some coaxing, the dog’s intense hunger and thirst eventually won out over her fear and she began accepting a little food and water from the women, who couldn’t believe what they were seeing. The creature was a pink, almost hairless bag of bones, with irritated, crusty skin and deep, open sores around her hips and back legs, most likely caused from lying in one place for a very long time. The largest wound, located on her left hip, was so deep Caron could see exposed muscle tissue and joint material. 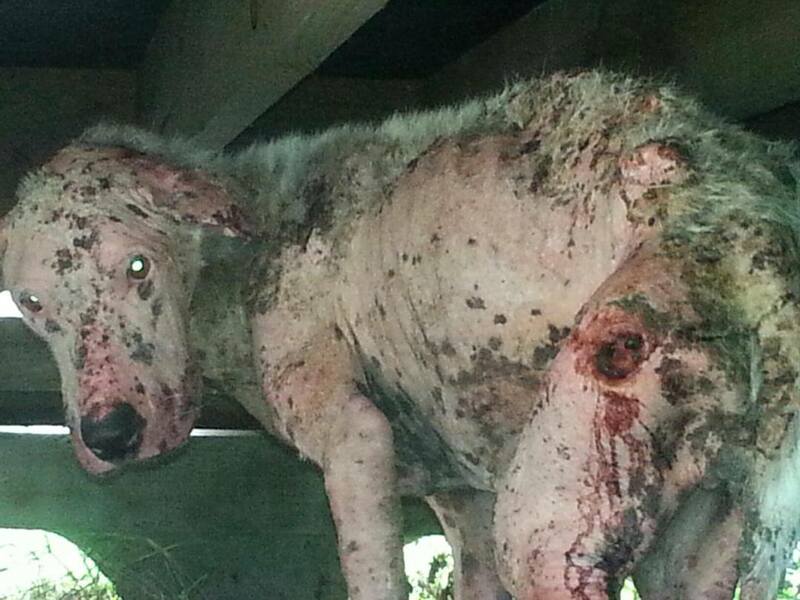 Sunshine when she was first discovered, in terrible condition and close to death. Photo credit: Caron Comas. Knowing she had to act quickly to save this dog from certain death, Caron jumped on Facebook and began searching for help. That’s when she discovered Pause for Paws, a non-profit rescue organization dedicated to rescuing, rehabilitating and finding loving homes for San Antonio’s abandoned street dogs. She sent them an urgent message along with a snapshot she’d taken of the dog cowering under the house, a disturbing image that quickly caught the attention of Pause for Paws Director Sharal Mackenzie, who immediately got on the phone with Caron to determine the desperate pup’s location. As someone who’s seen her fair share of street dogs on their last legs, Sharal knew this one was in big trouble. Without hesitation she reached out to Save Our Street Dogs San Antonio Texas (SOS-SATX), an all-volunteer group of dedicated street dog rescuers, to see if they had any members in the area who could pick up the dog. “When I saw how bad the dog was I knew we weren’t going to have much time to get her, or she was going to disappear somewhere and never be seen again,” Sharal said. Which was exactly what everyone feared had happened, because by the time SOS volunteers arrived at the abandoned house the dog had flown the scene. When they returned the next day, again, no sight of her. 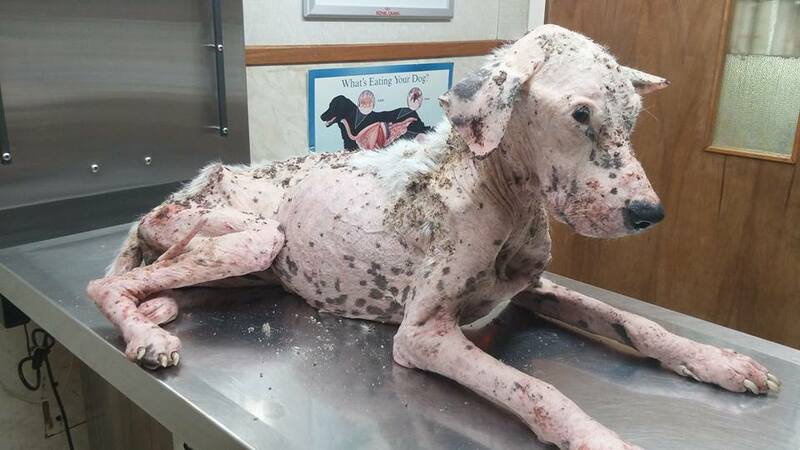 That’s because The City of San Antonio Animal Care Services (ACS) had gotten to her first. Sunshine upon arrival at Castle-West Animal Hospital, where she was immediately attended to by the amazing Dr. McGehee and his wonderful staff. Photo credit: Pause for Paws. “Thank goodness they picked her up because if someone hadn’t gotten her she would have been one of numerous dogs who die under houses or in bushes and nobody even realizes they’re gone,” said Sharal. As a city shelter with a good working relationship with many of the rescue groups in the San Antonio area, ACS willingly released the dog to Pause for Paws, who then rushed her to Castle-West Animal Hospital and Dr. Bill McGehee, the rescue’s longtime, beloved veterinarian. After someone was overheard saying, “That dog looks like she could use a little sunshine in her life,” the canine was promptly christened Miss Caron Sunshine, in honor of her rescuer. The newly named Sunshine had quite an extensive laundry list of medical issues. 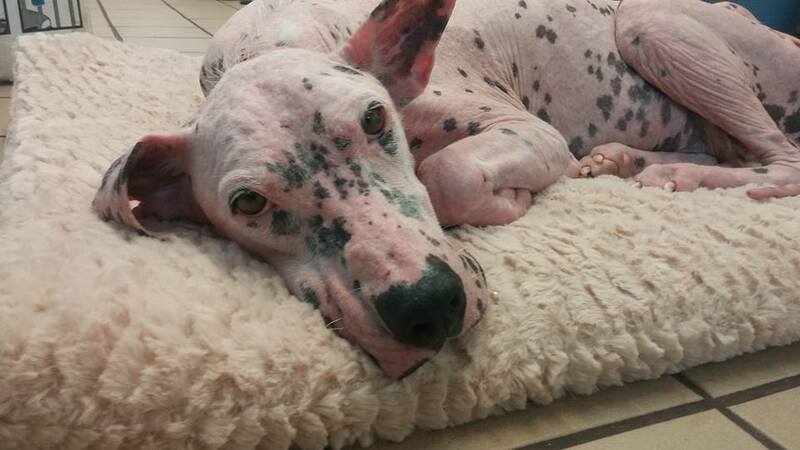 Besides being anemic and severely emaciated, she was plagued with demodectic mange, hookworms, dry, fragile skin and ugly, gaping pressure sores on both sides of her hips. The ugliest one on her left side was so deep it went straight to the bone. Sunshine enjoying the comforts of a doggie bed at the clinic. Photo credit: Pause for Paws. A blood transfusion produced miraculous results, and by the next day, Sunshine was active, aware and alert. But while it seemed the lucky canine had been delivered from death’s door, it was clear she had quite a road of recovery ahead of her, with myriad physical issues needing to be addressed. Along with antibiotics, iron supplements and several de-wormings, Sunshine’s intensive treatment regimen included daily mange baths and hydrotherapy to wash away dead skin, dirt and debris and infuse her wounds with oxygen to promote healing. In addition, x-rays revealed dysplasia in one of her hips. 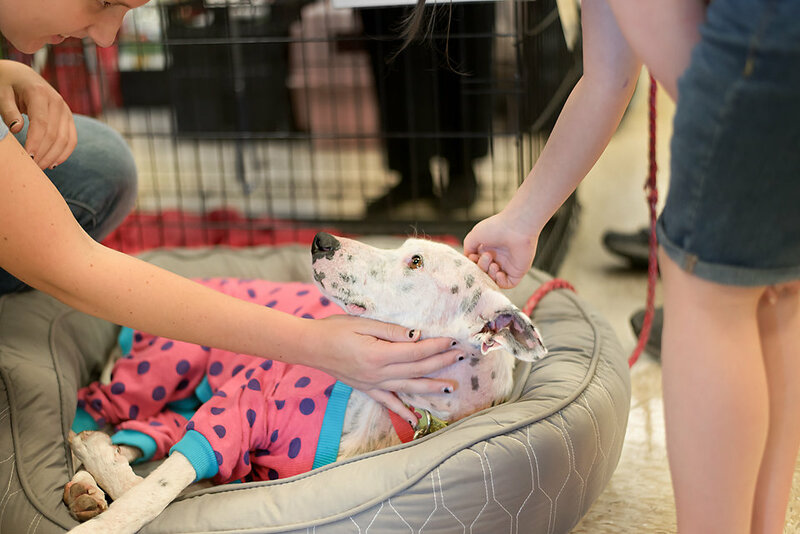 With the cost of Sunshine’s care estimated at $5,000 or more, Pause for Paws quickly took to social media, where they shared her story and rallied supporters. Soon the lucky pup had her own Facebook page, hundreds of “fans” rooting for her recovery and a generous community of donors who not only contributed funds but also medical and pet supplies. One supporter even sent Sunshine special doggie pajamas to protect her sun-sensitive skin. One of the most compelling things about Sunshine is her soulful eyes – they just draw you in. Photo credit: Pause for Paws. Feeling better by the day and clearly on the road to recovery, Sunshine quickly settled into life at the clinic, becoming a fast favorite of the Castle-West staff and clientele, as well as a local celebrity. As her body healed her personality blossomed. True to her name, Sunshine’s demeanor proved to be sweet and sunny, her personality loving and affectionate. Soon she had joined the ranks of the privileged staff dogs, earning free roam of the clinic and soaking up as much attention as she could get from visitors and employees alike. 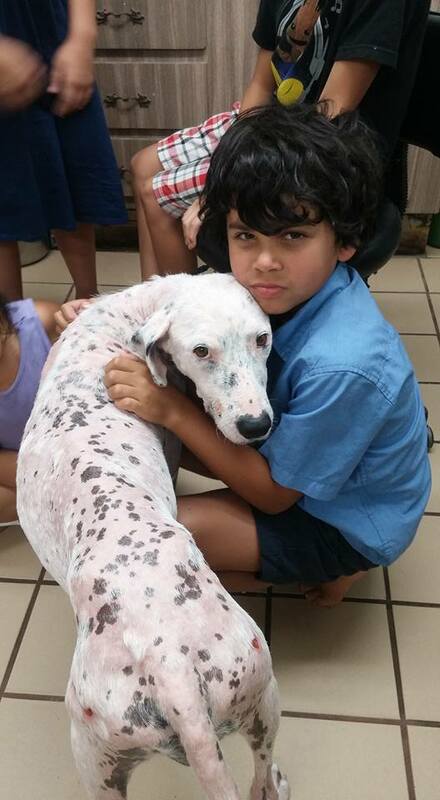 After almost two months of top-notch rehabilitation and care, Sunshine was a transformed dog. While all of her fur had yet to grow back, her skin was improving and most of her wounds had healed up well. But after such a long stay at the vet clinic, it was time for Sunshine to take her next step – she was ready to graduate to a foster home. Just as she’d done at the clinic, Sunshine immediately adapted to her new environment, this time in Jennifer’s home, where she quickly learned household routines and good manners by following the lead of her five canine and two feline foster brothers and sisters. Her life now a far cry from her lonely existence on the streets, Sunshine was getting a taste of what she’d always deserved – to be a cared for, beloved pet. 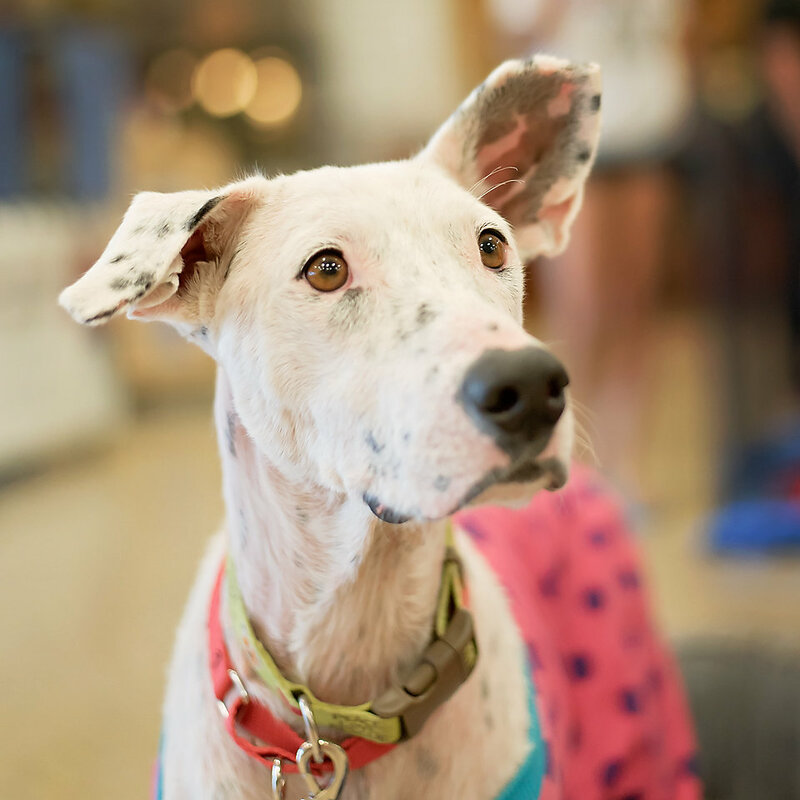 Watching her lounging on the couch, learning to play with toys, napping in comfy doggie beds or running around with Jennifer’s dogs in their huge backyard, it seemed as if Sunshine the once-invisible street dog had all but forgotten her unfortunate past. But when it comes to the fate of most street dogs, Sunshine’s happy story is definitely the exception rather than the rule. While the number of stray dogs in the U.S. is unknown, according to the World Health Organization, there are an estimated 600 million dogs living on the streets throughout the world. In San Antonio alone there are approximately 150,000 stray dogs, a serious problem that several rescue groups, including Pause for Pause, are trying to address. 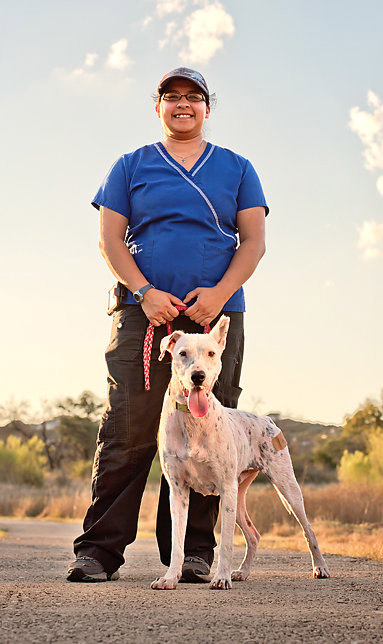 According to Sharal, one reason street dogs are able to proliferate in San Antonio is due to the region’s milder climate, which makes it easier for stray and abandoned dogs to scrounge, reproduce and survive for longer periods of time until they eventually succumb to injury, starvation or illness. Most of the city’s street dogs are actually lost or abandoned pets, she explained. Meanwhile, Sunshine has continued to flourish under Jennifer’s loving care and weekly follow-up visits at Castle-West, where she enjoys socializing with her adoring fans, hanging out with the staff and “helping” with patients. She has also become a regular fixture at Pause for Paws adoption events, where people often stop by just to get a picture taken with her. 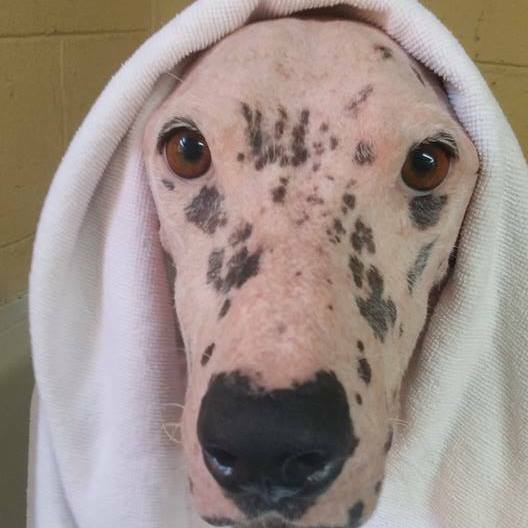 Three months after her rescue from the streets of San Antonio, Sunshine’s happy ending appears to be within reach. The lucky pup has already landed a wonderful family that has been following her story since the beginning and has waited patiently for the chance to adopt her. Once they’ve been approved by Pause for Paws, Sunshine will be ready to embark upon her next chapter – life in a loving, forever home. But none of that would have been possible without the village of amazing people who worked together to save one incredible dog. Sunshine’s incredible village of rescuers. 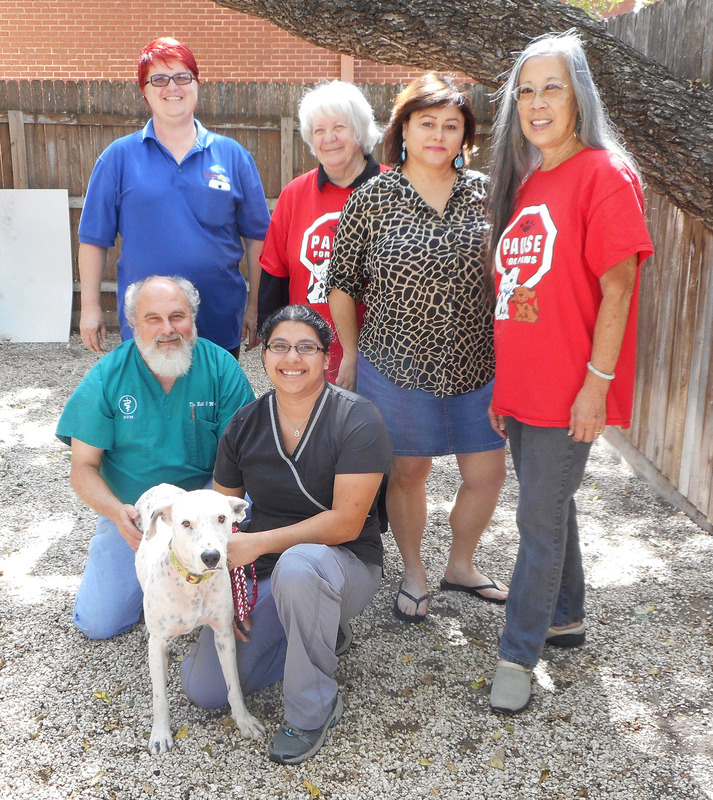 From left to right, back row: Caron Comas, Sharal Mackenzie, Elsa Benavidas and Deanna Lee from SOS-SATX; front row: Dr. Bill McGehee, Miss Caron Sunshine and Jennifer Rodriguez. Photo credit: Pause for Paws. Don’t just walk away, do something. If you don’t feel comfortable handling the dog yourself, contact animal control or a street dog rescue group. Don’t just leave the animal where it is and think someone else will take care of it. That attitude of, “it’s not my problem” is why so many dogs end up dying on the streets. Get a photo of the dog, as the shelter or agency will most likely ask for one. Once you’ve reported the dog, don’t think it’s no longer your responsibility – that will rarely get the dog off the street. Be willing to follow-up and follow through to make sure the dog receives the attention and care it needs. If you are able to retrieve the dog (please use caution when handling a stray dog, especially if it’s injured), don’t just keep it! That cute little dog you just picked up off the street may have an owner. Think in terms of what would you want somebody to do if it was your dog. Take it to a shelter or a vet who can scan it for a microchip, then do what you can to get the dog home, including posting signs in the area where it was found and/or circulating photos on social media. If you see a mother dog and her puppies on the street, don’t just pick up the puppies and leave the momma behind. Leaving an unsterilized, lactating female dog on the street is not only cruel but also perpetuates the problem, as she will simply reproduce again. Consider fostering the dog. This not only saves a life, it also allows shelters and rescues groups with space issues to help more dogs. Like Pause for Paws, many shelters and rescue organizations will provide medical care and supplies – all you have to do is supply a home, some food and love! If you can’t foster, donate. For most shelters, especially smaller ones, money is always an issue, so anything you can donate to help the animals will be incredibly appreciated. Having that extra funding may mean the difference between that shelter being able to help another animal or having to turn it away. Get out and promote spay and neuter. Talk to people, especially your neighbor with the unsterilized dog that keeps having puppies. Be diplomatic and take every opportunity to educate people in a kind, non-judgmental way. Talk to them about why their dog acts crazy or aggressive because he’s living in the backyard alone on a chain. Educate wherever and whenever you can – spreading awareness does make a difference! Sometimes it takes a whole community to make a difference for dogs in need – Sunshine’s story is living proof of that fact. Because in the end, every dog deserves a home and all dogs are equally deserving of living safe, happy lives as beloved companions. Our planet’s street dog problem is not a canine problem, it is a mess we humans have created through reckless overbreeding and irresponsible pet ownership. We domesticated dogs to live side by side with us and they have remained loyal to us for thousands of years. We owe it to them to fix this crisis once and for all. This entry was tagged animal cruelty, animal welfare, dog rescue, street dogs. Bookmark the permalink.